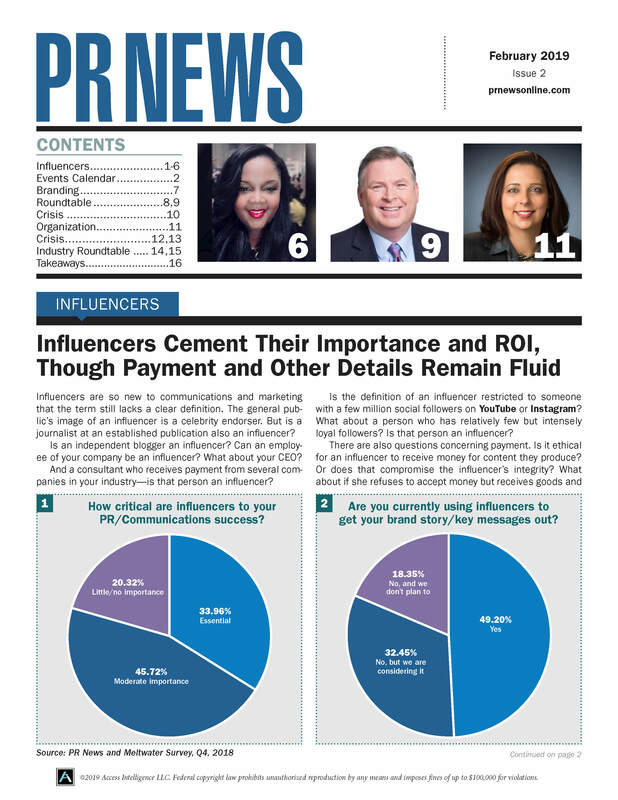 Each year, PR News benchmarks the top established PR professionals over the last year, as well as naming a shortlist of rising luminaries in the field. These accomplished communicators are celebrated at PR News’ PR People luncheon, which this year will be held Dec. 4 at the National Press Club in Washington, D.C. So what does it take to bring home a PR People or Rising Star award? As we went to press Tuesday a slew of top-flight communications and marketing positions changed hands. The biggest was the move of Salesforce’s CCO Corey duBrowa to Google. In 2017, Carmen Collins became the manager of Cisco’s talent brand social media team globally, a year after creating one of the industry’s top employee advocacy programs. Launched as a pilot in the spring of 2016 and a full-fledged program in the summer of 2016, the WeAreCisco Snapchat channel was Collins’ brainchild. In the last 12 months, the program has doubled unique daily views while flashing completion rates of 60% to 70% completion rates are way above industry average research. Intern of the Year Delaney Lanker was tasked with drafting HP’s pitches, researching media targets and conducting outreach to lifestyle, travel and parenting magazines. In less than a month, she placed HP product Sprocket with Travel & Leisure, which has a print audience of 6.3 million. A natural leader, Lanker also shows HP’s other interns—many of whom have never had a “real” job before—best practices for taking notes in meetings, writing blog posts and asking for feedback. Molly Levinson is a known problem-solver and in 2017, the problem she tackled was fake news. Levinson led the crisis management and communications efforts for the matter widely known as “Pizzagate”—months of sustained online attacks and perpetuation of conspiracy theories aimed primarily toward a Washington, D.C. restaurant, Comet Ping Pong—which spread virally online. A dual-degree Marketing and Public Relations senior, Maddy Gildersleeve has excelled inside the classroom and out. Just within the past year, she has garnered experience as a digital marketing intern for Meredith Corp., a social media and marketing strategist for Power Life Yoga and an account management intern for FCB Chicago, where she played critical roles coordinating project timelines and conducting digital media research. With Franz Paasche leading the way, PayPal’s communications function has helped shift perception of the company from its legacy reputation as a “button on a website” for online payments to an innovative financial platform that collaborates across the industry to provide secure commerce experiences wherever users are actively engaged. And after recent tragedies, including Hurricane Harvey, Paasche has acted as a key advisor in the development and launch of a disaster relief campaign. Marketer of the Year Dawn Callahan is an award-winning marketing visionary who is part of the leadership team that took Boingo Wireless from a small startup to a global Wi-Fi leader. Meanwhile, Callahan’s co-winner Luke DeRouen has been responsible for solidifying Arby’s brand communications strategy over the past three years—a strategy that has resulted in the brand delivering exceptional programming and increased sales results.